Members from all over the world – including undergraduates — are coming for three days of exciting, stimulating and innovative workshops and forums. Dressed in their signature colors of pink and green, members will also engage in a series of service projects aimed at uplifting the community and showcasing Alpha Kappa Alpha Sorority as the premiere global service organization. The Sorority has designated Thursday, July 18, 2013 as “Global Service Day.” Members will dedicate the day to its mission of “service to all mankind” through partnerships with various service organizations in Montreal. 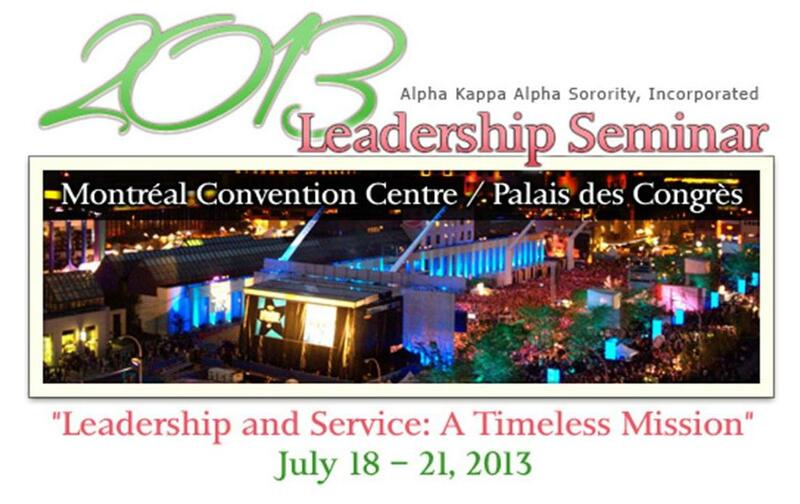 Alpha Kappa Alpha will provide gift cards for groceries to support AMCAL Family Services, donate gently-used career clothing and shoes to YWCA Montreal, and will contribute school supplies and books to Cote des Neiges Black Community Association and Coffre Aux Trésors du Chaînon.Alpha Kappa Alpha will also provide snacks for youth attending Cote des Neiges Black Community Association’s youth summit. On Saturday, July 20, 2013, members will continue the Sorority’s service mission by working in a community garden with Action Communiterre. The Sorority selected these organizations because they mirror AKA’s service mission by providing resources and a helping hand vital to youth, women and families. Stewart said that rendering service to the agencies is in keeping with Alpha Kappa Alpha’s 105-year-old service mission. The Sorority will host a series of forums aimed at engaging participants on current global challenges. There will be a Human Trafficking Forum on Friday, July 19 where panelists will join members in providing “The International Perspective on Human Trafficking.” Many of the panel participants are from Canadian law enforcement agencies. Alpha Kappa Alpha will also hold a Corporate Glass Ceiling Forum where a panel of Canadian citizens and representatives from major corporations will join members in exploring common concerns and identifying best practices solutions. At the same time, the forum will provide mechanisms for mutual collaboration and support. The Forum will be held on Friday, July 19 at Concordia University. Sorority members will carve out time to savor all that Montreal offers including its cuisine and tourist attractions. It is expected to pump hundreds of thousands of dollars into the Montreal economy during the three-day stay.